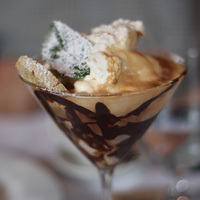 I tasted the most delicious truffle limoncello ice cram yesterday at an Italian restaurant in San Francisco. The day before, at my house, I prepared gelato affogato as an after dinner for some foreign friends vacationing in California. After two consecutive days of ice cream, which is something I don’t do often, I am now in the mood of organizing an ice cream party for adults and kids, before the autumn falls. Among all the parties, ice cream party is one of the least pretentious and inexpensive parties we might be involved with. It takes very little planning, very few ingredients and backyards are just perfect. 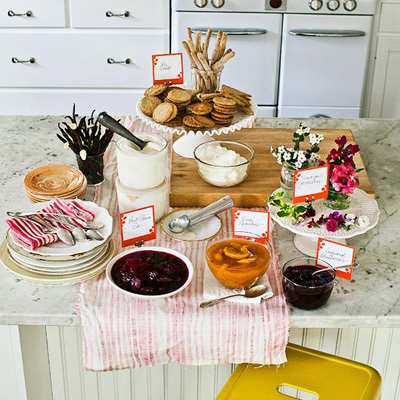 Set the mood and decide on a particular era into which to set the scene of the ice cream party. 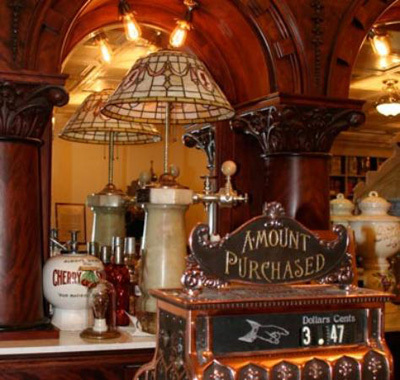 Ask your guests to come dressed up in costume of the era designated and choose the music to go with the theme. I would suggest to discard the present time, we are already living in today’s time and we know how this reality is, but setting up an ice cream party in a nostalgic era, will give us a chance to live, relive or fantasize it our way, without the challenges that came with any given era. Do you like the party to be set in the ‘20s or ‘30s? You will find plenty inspiration in the roaring age, flapper girls’ fashion and Charleston music. You might like the more modern ‘50s and ‘60s era, in which also you will find a lot to play with the sophistication of the ‘50s and the rock and roll of the ‘60s. Perhaps, you like to experiment or relive the ‘70s and the concept of the hippies’ era, bohemian style and flowers kids. In the history of costume, there is a lot to chose from and I think it’s always the right time to dress up in style for any theme party and not just for Halloween. 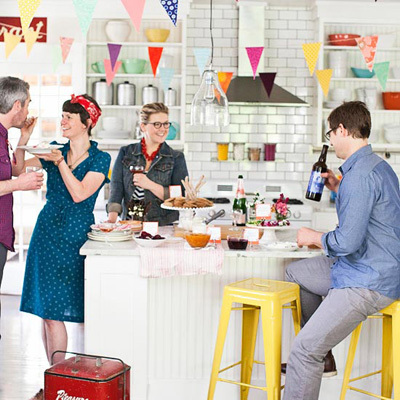 Decorations and invitations should follow the theme of your party. Hand written personal invitation cards reflecting the theme of the party will make an impression. Your guests will know to have been invited to a real “scoop” of something tasty. For an ice cream party we don’t need much, only a great attitude towards food and a few ingredients. Don’t worry about diets, just go to the party and enjoy the moment, tomorrow is a different day. 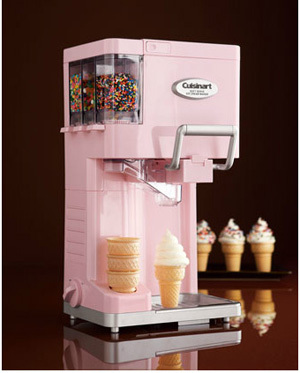 We need first an ice cream machine to help making all the ice cream, gelato and sorbet we need in a quick time. The machine in my photo is sold at Neiman Marcus for less than $200.00. Furthermore, we need a fruit variety for making both sorbet and ice cream, many varieties of toppings such as nuts, chocolate chips, edible flowers, paper or waffle cones, ice cream glasses, spoons and saucers. Designate areas for toppings, fruits, garnishes, cones, all the ingredients for making various type of ice cream; then designate a different area for all utensils and one more area for all the drinks. This way, the traffic will flow harmoniously and your guests will not be on top of each other preparing their own ice cream. I suggest some fun drinks for the adults: sparkling wines mixed with any kind of fruit juice, strawberry, oranges, cranberry, blueberry, pear, pineapple, apple, peach juices, or anything else you like. Decorate each drink with a berry or a slice of the fruit used as a mixer. Pink champagne is especially good as palate cleanser between ice cream tasting or right after, but don’t spend lot of money on the most expensive champagne, the fruit and the champagne must compliment each other and not fighting. I know the kids will like to drink all kinds of sodas and bounce from wall to wall for all the excess sugar, but it will be better to serve them something simpler and healthier: mineral water mixed with any fruit juice of their liking. They will have the impression of drinking champagne like the adults. 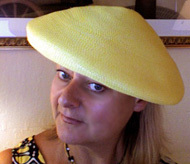 Valentina Cirasola is an Italian Interior Designer since 1990 and a former Fashion Designer. She blends fashion with interior and colors the world of her clients with designing, teaching style and table manners, party organizing and public speaking. She has been described as “the colorist” and loves to create the unusual. She translates colors into excitement. Valentina’s new book on colors will be in the market soon: RED-A Voyage Into Colors. I love ice cream. This is a perfect way to celebrate the last days of Summer. Exciting and fun post. Thanks. Celebrating every little moment in life is healthy even with ice cream. Thank you for stopping by. An ice cream party is a great idea! I don’t think I’d spring for the $200.00 machine, but any ice cream is a nice way to celebrate the end of summer. Thanks, Valentina! Robin, as I am sure you know, there are other ways to prepare ice cream. That machine is very pink, pretty, inviting and very quick. Invite your friends and celebrate the last part of summer.